Our new site on VPS fast and maximum downloads. On computers Hindi is mostly used for typing work. In general Microsoft operating system and Office is still frequently used programs. Open Office is used at some places. Hindi Face fonts are increasingly being used for various formatting styles in institutions associated with publication. As the scope of internet has widened, the requirement of Hindi unicode has increased proportionately. 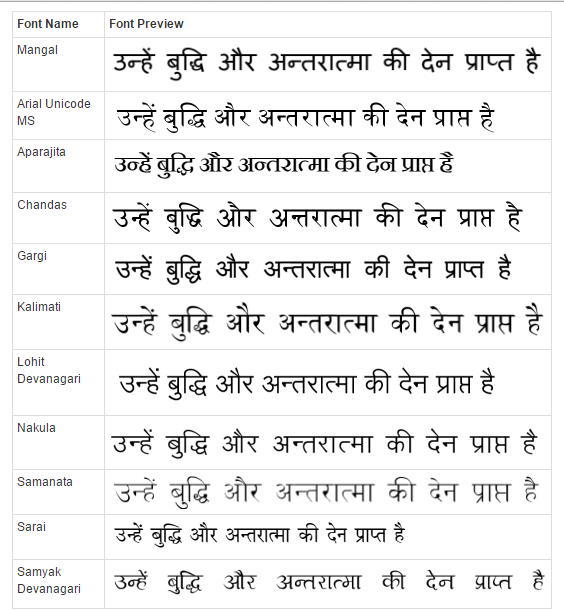 Hindi Face fonts are primarily English or symbol based having Hindi devnagari look and these become illegible if not installed in or by the computer whereas unicode based Hindi fonts display Hindi on computer screen despite Hindi fonts not having been installed in computer through the default font available in computer. Hence the same text is displayed even if that is opened in different computers. Technically, in India English is still a dominant language so far web, IT and computers are concerned. The use of Hindi is increasing as the number of its user is multiplying. Along with the efforts of the government the private institutions and experimenting technicians have also paid attention to this phenomenon. The efforts of these all and the concept of open source has somewhat facilitated Hindi. In order to make adequate use of these facilities and to spread the use of rajbhasha we have endeavored to make them accessible to a larger segment of people interested in using Hindi as their first language. 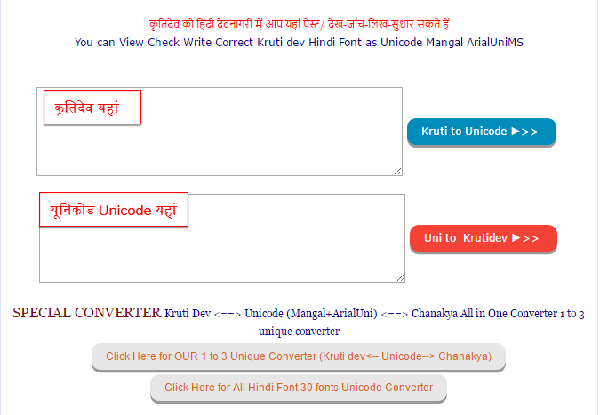 Kruti dev to Unicode Mangal converter and Unicode Mangal to Kruti dev viewable Hindi Converter. This is 8 Year old converter but chaged for viewing Hindi in Kruti dev. You can type or write or paste Kruti dev or Unicode Mangal text and convert very fast. This will work Offline also as fine as Online. This is very big converter. You can convert 30 Hindi Fonts to Unicode Mangal. Any font is not in list use Contact Form and Inform us. We shall try to include desirable font for Unicode Conversion. Unicode Hindi is Only future just like English same keyboard same char but different face of fonts. Windows Unicode Hindi Fonts pre installed in OS but If you want to change look use any Unicode Hindi font. Here are download link of google drive so download easily or copy in your google drive. 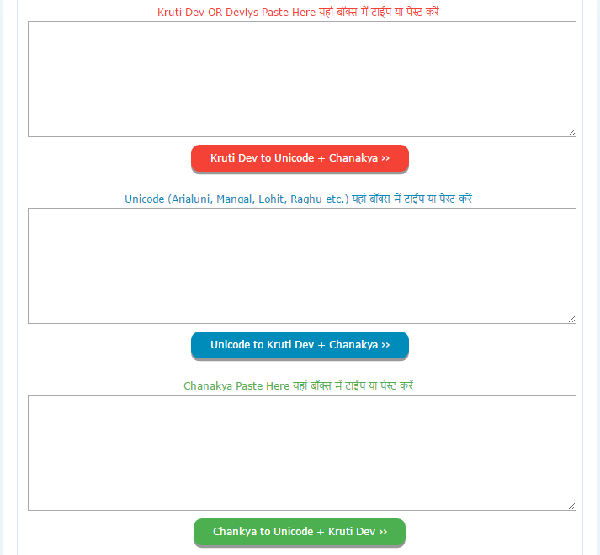 Download Hindi Unicode fonts. This is Unique 1 to 3 Converter. 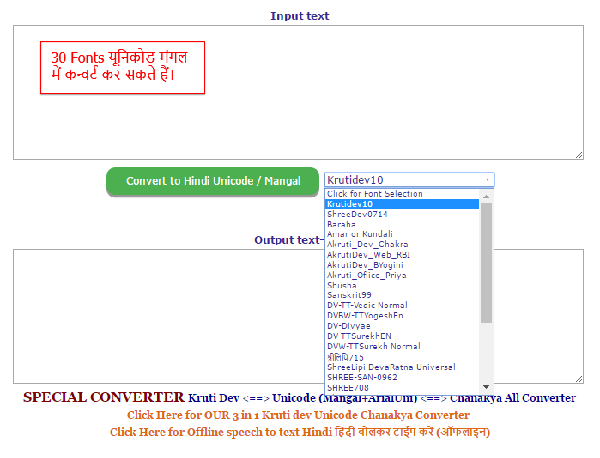 Use Kruti Dev Chanakya and Unicode any text to convert in other format fonts. One Click and two conversions and 3 column is its beauty. Spead is high and offline also work. This is very useful for book publication, newspaper and magazine related work. Web support and desired Font conversion both possible in one click. Anunad Singh ji's basic code used and changed. संदेश मिलने के बाद आवश्यकतानुसार साधन से आपसे संपर्क किया जाएगा, धन्यवाद। Thanks for filling out form!